Yesterday, I sat in the stands and watched you cross the start/finish line for what may very well be your last time in NASCAR's premier series. I cried. I wish I could have heard you thank the team, and everyone involved in your career over the scanner, but I know I wouldn't have been able to see through the tears. The funny thing is, I still couldn't see through them. I cried a few times. I didn't need a scanner to convey to me what I knew you'd be saying to the team. As I stood for the anthem and looked up and down pit row, I saw legions of people surrounding the No. 88 of Dale Earnhardt Jr., then looked to your pit stall. (You know you're easy to find on pit road, right? Just look for one of three spaces: the first stall on pit-in, the last one before the entrance to the garage, or if you have the pole, the last spot before pit-out.) The faithful stood by you, just as we always have. Kenseth Nation is still very much alive, and we plan on being there forever. You got a raw deal. There's no other way to say it. How is it that a championship-winning driver who's still very competitive gets pushed out of the sport he's dedicated his whole life to, while a young driver with not-nearly-enough experience gets to take over a high-profile ride? How is it that no car owner has room, and no marketing team can secure you sponsors? Your talents are not limited to one type of track. You drive the car from the back to the front in record time because, as you've said in the past, you're just not great at qualifying. You accumulated so many points in 2003 that NASCAR had to reformat the way the Championship was won. You have two Daytona 500 wins under your belt, and 37 other wins to go along with them. You're kind, humble and a leader in the garage. I know three drivers walked away tonight, but you deserved more accolades than you received. That's your nature though. You're never one to want the spotlight, never one to want the parades and showers of gifts. You came to race. You wanted to the focus to remain on racing until there was nothing left to race for but that one last win, which you claimed in Phoenix. Would you have wanted a tribute video? Probably not. Did you deserve a tribute video? Yes. I came into NASCAR as a Jr. fan, but came upon a documentary called "Matt Kenseth: Beyond the Glory," on my local Fox Sports affiliate about 13 years ago. I was really into racing, so I watched it, and was fascinated by your drive to succeed, while remaining a shy, humble guy from Cambridge, Wisc. I listened to the story of how you and your father came to an agreement on the purchase of your first car, and how you worked on it all the time, and then late model after late model, just trying to make a name for yourself. A notice from Mark Martin and driving for Robbie Reiser made your jump to the next level possible, and DeWalt came along for the ride (but not before their VP of Marketing took a spill onto the floor of Robbie Reiser's office after his chair broke). Thank you, DeWalt for taking this journey. 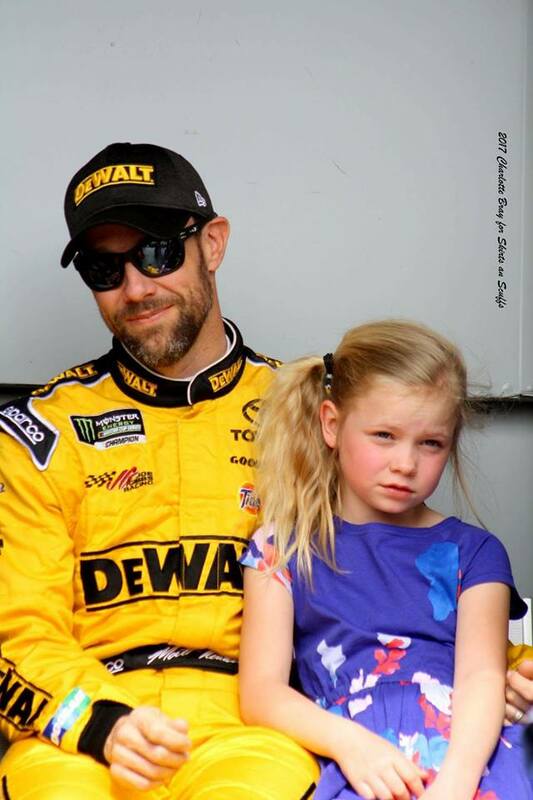 Kids want to be race car drivers because they saw Matt Kenseth: a guy who never gives up, no matter how his day is going, and a guy who races everyone clean, and (usually) gets the same respect in return. "The incident" has been beaten to death, but you stood your ground, because you had been wronged. That day, you were the bat. I can't tell you how awkward it will be not seeing you in a car next season. My heart hurts for you. But, as I wrote in an old blog right after you announced that you'd be leaving Roush Fenway Racing for Joe Gibbs Racing, I picture you taking Katie's hand, surrounded by your girls, and walking off into the sunset. Life awaits you, a new baby awaits you. Normalcy awaits you. But maybe you weren't ready to be normal. I know I wasn't ready. Thank you for making me a passionate fan. Thank you for giving me hope, inspiration and the knowledge that anything is possible, if it's what you want. NASCAR may not know what they'll be missing without your leadership and guidance on the track next year, but I know, and it speaks volumes. Thank you Matt for all you have given to NASCAR and your fans !! You eill be missed and I sure hope we see you racing again!! Very well said, Stephanie!I totally agree! Yep! It made me mad and sad that Matt didn't get the rightful accolades he so much deserved. He didn't give them much time but Homestead-Miami could have did a whole lot more. It was Dale Jr. who insisted he get some recognition and I believe he wanted him to ride along side of him before the race but apparently the idiots had different ideas. I came into the sport not knowing much of anyone but I singled out #MYManMatt (what I've called him for years) right from the start. Couldn't put my finger on it, but there was just something there. I had a hard time understanding him he talks so fast, lol, but he's just a good guy. You never heard his cussing his crew out. Like you I'm in disbelief and brokenhearted over this deal. And I'm really not a fan of Joe Gibbs anymore. What a beautiful tribute to Matt. He is such a gracious and loving man. I grew up with his mother and she did an awesome job raising her two children - Kelly and Matt. Enjoy your time with your beautiful wife and children. Normal time Matt. VERY WELL SAID! As a Matt Kenseth fan I cried like a little baby! i have only been a Matt Kenseth! I have a 15 yr old son that is pastionant about Matt! I will not be watching NASCAR next yr. unless i hear that u are racing at least filling in. May start watching again when Ross gets a ride! all my love to you and your family Matt.